Pat chicken breasts dry with paper towels, chop into bite-sized chunks, and place in a bowl. Discard the leafy end of the lemongrass and finely slice approx. 5 cm of the root end. Chop onion, garlic, ginger and red chili pepper. Transfer sliced lemongrass, onion, garlic, ginger, and red chili pepper in the food processor with part of the olive oil and blend to a smooth paste. Pour marinade over the chicken and let marinate for min. 2 hrs. in the refrigerator. Wash and drain lamb’s lettuce. Cut the carrot, zucchini, green beans and a head of broccoli into small pieces. Place the lamb’s lettuce in a bowl and dress with remaining olive oil, balsamic vinegar and season with salt and pepper. Heat a non-stick wok to a medium heat and transfer the marinated chicken to the pan, followed by the chia seeds. Stir well. Fry the chicken for approx. 5 min. or until golden brown, using a spatula to turn the pieces. Turn down the heat, cover the wok and let cook for approx. a further 2 min. or until cooked through. Add all the vegetables to the pan and season with salt and pepper. Toss the vegetables and chicken with the spatula and let it cook again for approx. 4 – 5 min. or until cooked through but still crunchy. 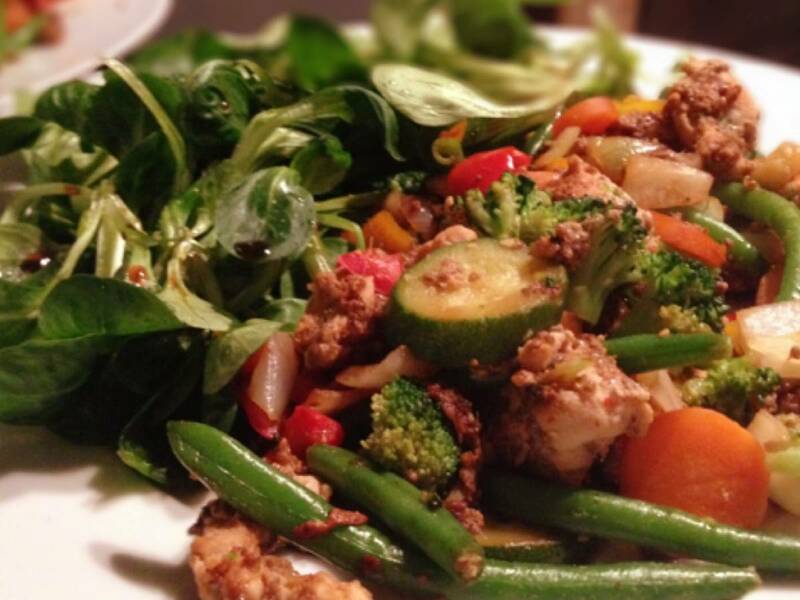 Serve the lamb’s lettuce with the chicken and vegetables. Enjoy!